Ceiling Fans There are 5 products. 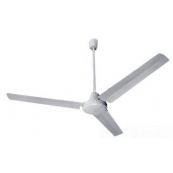 Airmaster Mark I Ceiling Fan is 56" and It's Recommended Mounting is Between 15" & 30" From Ceiling to Bottom of Fan. Safety Cable Included, Operates at 120Vac Energy Consumed is 62W at .52amps At Full Speed 290-rpm Moves Air At 26,400-cfm. 56" Moisture and Dust Resistant Ceiling Fan Recommended Mounting Between 14" & 32" From Ceiling to Bottom of Fan, Safety Cable included, Operates at 120Vac Energy Consumed is 120W at 1.12amps At Full Speed 311-rpm Moves Air At 32,900-cfm. 60" Ceiling Fan Recommended Mounting Between 15" & 30" From Ceiling to Bottom of Fan, Safety Cable included, Operates at 120Vac Energy Consumed is 120W at 1.20amps At Full Speed 320-rpm Moves Air At 39,600-cfm.